The thymus gland is the primary lymphatic organ in the body. It is located over the heart and/or in the neck area, anterior to the ascending aorta and posterior to the sternum. 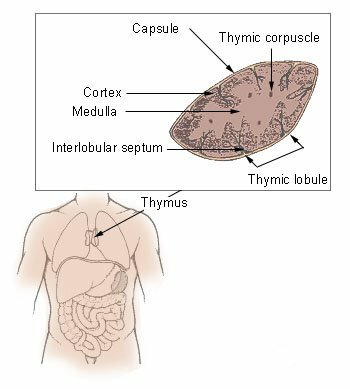 The thymus consists of two lobes enclosed in a capsule and is further divided internally by cross walls into many lobules, called thymic lobules. The primary function of the thymus is the processing and maturation of special lymphocytes (white blood cells) called T-lymphocytes or T-cells, which are associated with antibody production. T-lymphocytes migrate from the bone marrow to the thymus, where they mature and differentiate until activated. While in the thymus, the lymphocytes do not respond to pathogens and foreign agents. After the lymphocytes have matured, they enter the blood and go to other lymphatic organs where they help provide defense against disease. The thymus also produces a hormone, thymosin, which stimulates the maturation of lymphocytes in other lymphatic organs. The thymus is relatively large in infants and children but after puberty it begins to decrease in size so that in older adults it is quite small. Athymic individuals (people who have no thymus) lack T-cells. A thymoma is a rare tumor of the thymus gland. The tumor can arise from any of the cell types in the thymus gland and can be cancerous or noncancerous. Thymoma is associated with the automiiune disorder myasthenia gravis.